THERE IS A MISTAKE IN THE CURRENT VERSION OF THE PATTERN! --> Then you should crochet step 15 as it is written down in the pattern. --> step 15 = 24st, instead of 20. --> Then continue to work on step 16. 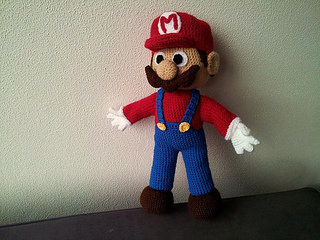 Mario will become about 35cm/14” tall.